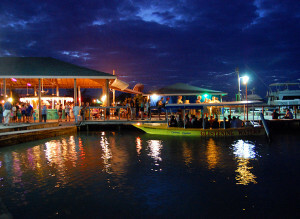 Take a boat tour on the Luminous Lagoon. You’ve heard that saying of you’ve got to see it to believe it, right? Well, just East of Montego Bay, near Falmouth, Jamaica is a little bay with an unbelievable phenomenon that you simply need to see with your own eyes. Come out to Glistening Waters for a tour after dark and get ready to witness one of Jamaica’s only natural night-time attractions, the Luminous Lagoon. 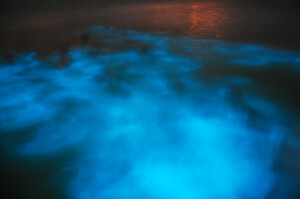 The waters that surround Oyster Bay are home to tiny bio-luminescent micro-organisms that glow and emit a blue light when disturbed or agitated. Simply disturb the waters with your hands and watch as the waters create an unusual lighting effect that is one of a kind! Take a night-time boat tour out on the bay and watch as the wake behind the boat lights up and illuminates an almost unbelievable fluorescent blue glow. Watch the water change color around you. You can see a blue outline illuminating on fish as they dart across beneath the surface. Take a swim and literally be amazed as the water around you lights up. Words cannot sum up the experience at Glistening Waters Luminous Lagoon, you simply must take part in witnessing it with your own eyes. It is truly an amazing thing to see and will leave you with an exciting sense of awe and astonishment and certainly be something you will remember forever. This unusual scientific phenomenon only occurs in 4 other places in the world. This location in Jamaica is the brightest and most illuminating of all places worldwide that this occurs. Scientists and marine biologists from John Hopkins University have come to study it and now visitors from all over travel to Falmouth to witness Mother Nature’s rare event. On the tour of the Luminous Lagoon, your boat captain will talk about the history of Falmouth and also about this color changing water. The waters are believed to have natural mineral healing effects and some people will tell you they feel refreshed and rejuvenated after taking a swim in the bay. I’ve done it and can say it was one of the coolest experiences of my life. Never will you see such cobalt blue colors just appear out of the darkness of water as you will when you’re here. Glistening Waters Marina in Jamaica. 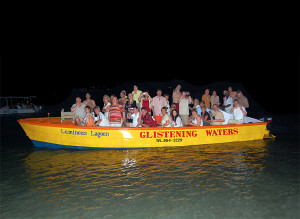 The Glistening Waters Restaurant & Marina is where the tours operate from, every night starting at dusk. The restaurant serves up excellent Jamaican food, fresh daily seafood specials and is worth it to take the tour and enjoy a meal. They have a great atmosphere and a beautiful setting on the bay. Their outside entertainment area includes a large patio, outdoor bar, usually live music playing at night with lots of people eating, drinking and dancing. They also operate deep sea fishing charters in Jamaica from the marina. You can book a half-day charter, a full-day or customize it however you and your group wants. During the International Marlin Tournament, this place gets busy with vessels from all over coming into dock. You’ll find some great fishing off the Northern coast of Jamaica, especially near Falmouth. 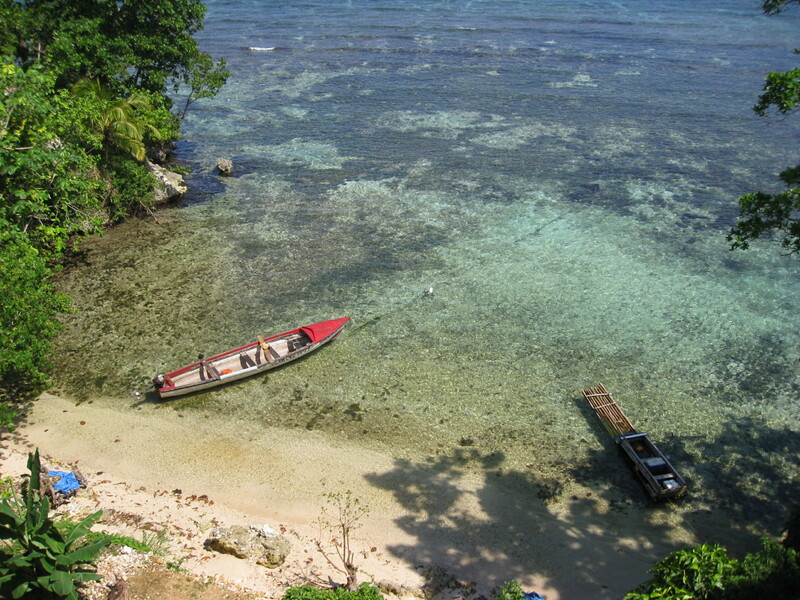 This is a great location for some serious sport fishing in Jamaica! Stop reading now and just plan on getting to Glistening Waters during your next trip to Jamaica. You’ll be glad you did. Witnessing this rare event is an experience that will create lasting memories that you’ll talk about for a long time! It should be on everybody’s bucket list. See it and you’ll know why! This entry was posted in Entertainment, Falmouth, Fishing, Island Tours, Montego Bay, Restaurants, Scuba Diving, Things To Do, Travel. Bookmark the permalink.